In this continued update of a print in progress, the student concerned completed the first attempt at using commercial spray print. This print was always intended as a multi PLA project, and for a tractor theme with stationary storage. 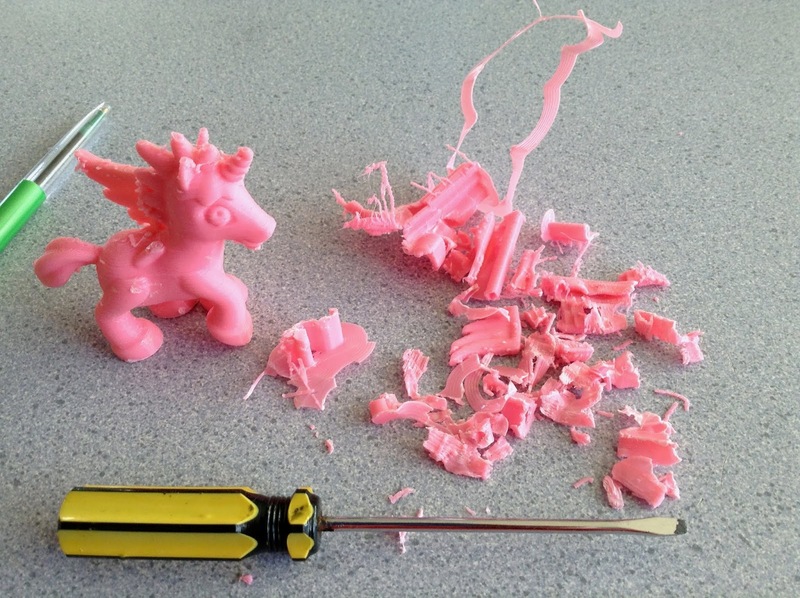 The student concerned has been able to master 3D Printing in a short space of time and I was looking for a project that would push her and challenge her with her designs. In addition looking for another way to extend students I delibrately used a pink PLA for the design (mixed with a gray) . Finally we have been further experimenting with the use of a new super glue to look at bonding all the elements of the print together - which is appearing to have a better impact. Above: Slots for holding the iPad shown. Challenge: To use a commercial product with an iPad that currently did not meet the specifics of the holder that existed. Students need to replicate and manufacture a commercial piece, adapting it to ensure that it worked better to meet the needs of the students at our school. Above: The final print being tested. and to consider the non-removal of the case. The students had to re-create an existing piece, and then modify it. A small challenge was that the device holds the iPad at an angle. Using a protractor the students identified the angle as being a thirty degree angle. There is a compass option on Tinkercad alllowing the creation of specific angles of design - the students utilized this to create a 'perfect' thirty degree angle for the 'hold' of the device, which testing showed subsequently worked perfectly as a result. As a result the print served it purpose, allowing the commercial program to work perfectly, with more flexibility than had been the case with the single available hodler. Level of Difficulty: Medium - there was an exisiting template to be followed which was set by the stand that the students were trying to create, and the print itself was bound by this, it also made the print slightly more complex because it narrowed the success of the project. Timeframe: Fifteen hours - we needed to have depth to the base so the iPad holder wouldn't tip, as it is intended for use primarily with junior students, which in New Zealand is five year olds. Given that and the specifics of the print the time couldn't really be reduced by removing elements of the print, or reducing the infill (which was the standard twenty percent). Size - As mentioned the slot for holding the technology (in this case the iPads) was a thirty degree angle. The base measure 185mm across, was 110mm deep and 20mm thick. This was stretching the Ulitmaker 2+ to the largest width across possible. The base was 20mm tall and thick. What we would do differently/next steps for students: The task was completed successfully and had a practical application for the device, which worked in conjunction. Alternating the size of the holder would allow for differing devices, including those in Life Proof cases to be used with the technology. Challenge - For student who is nine years old to create an original iPad Stand to give as a gift to another student. No teacher input (design) into this project, design, creation from scratch. Background: This student has been responsible for several high quality designs and projects this year, including this 'deluxe' iPad stand featuring a Unicorn as part of the design. This project was intended for an older recipient, as a result of which other than the penalization on the rear of the design (see below) was deliberately kept to a minimum. The student as noted above was responsible for every aspect of managing the project from initial design and concept, the Tinkercad creation of the design, the checking and the proofing of the design (consulting wiht another student to ensure that it would be a successful print). The sole responsibility of the teacher was to print the project and suggest that two different PLA plastic were used to highlight the 'EBS" font/title that was on the back inside the speech bubble. Level of Difficulty: Medium. These designs have been printed in considerable variation and number in Room Six this year. The students have continued to refine and improve their design minimizing the amount of rafting (and waste plastic) and using a mixture of combining PLA colours to produce lettering and features that stand out. These are being produced to a high degree of skill able to work with a variety of iPads and including storage and details. These are being produced with increasing skill, based on the work of the other students. Its not a task for the faint hearted but when it works (like this) it produces something that has a lot of use that is highly durable and successfully completed the task. Time frame: Twenty One hours for the base. There would have been some flexibility had the student decided to include a draw in the base or reduce the width and the depth of some of the sides etc. Size: This design was 130mm across at the front. The front bar to stabilize the iPad is 40mm in length, 20mm consisting of the base and a further 20mm for a bar. The base of the stand has a length of 120mm. The back of the stand has a storage box dropped into it with dimensions of 50mm by 120mm. The storage at the back rises 100mm from the base of the design. This would be more or less the minimum requirements for a design such as this to work. Original Print Date - 25th of September. This print has now been on display at our school, in an outdoor setting, for an entire month. It has been exposed to the elements (Winter in New Zealand). During this time we have been monitoring the strength of the print and the discolouration (if any). After one month there has been little of either and the print has maintained it shape and colour without any obvious signs of weathering. This print is for an emergency assembly location. Original Print Date - 23rd of October. This is the 'tractor' themed stationary holder has now been partially assembled, with the intention of using commerical spray can paint to change the colour of the print. 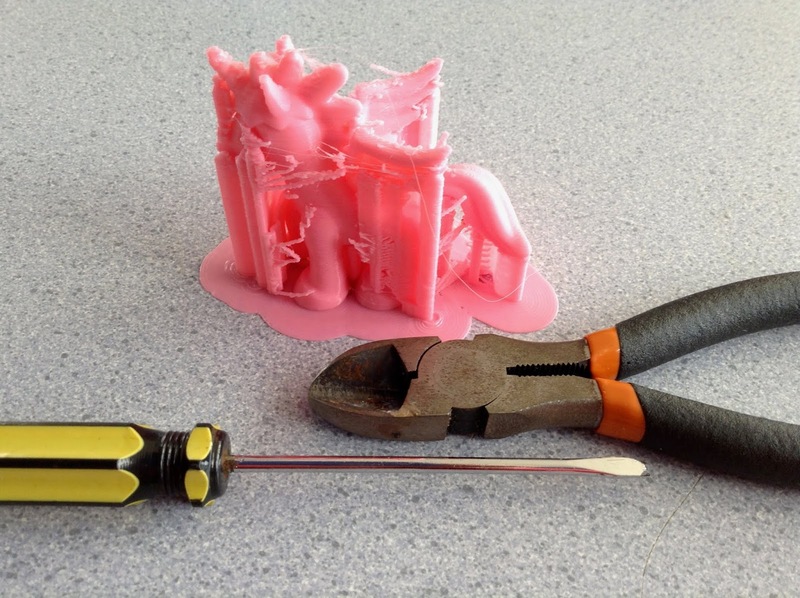 It was also decided for the affect to print this in component stages and then use superglue to combine the elements of the print, as shown on the left. Above: Base of the design shown above. Challenge: Student looking to push themselves by producing an advanced multi-part desk stationary holder with a 'tractor' theme, personalised for the student that it was intended as a gift for. Background: This student has completed a number of previous projects and was looking to extend herself by producing something significants with an original creation - she made the decision early on to create this project from scratch, not relying on prebuilt models of using freely available models - this proved to be challenging as she needed things to be relative to scale and also wanted it to have a purpose that it was able to store stationary. The wheels had to look right, but we're required to work. She originally created an 'all in one design' featuring all the wheels, lettering and scoop for the tractor in a single design. This design didn't have the desired affect, as the wheels and the scoop suffered from being part of a single block. When this was discussed with the student it was redesigned featuring components - the base shown above left, this had a much more polished affect that the student was very pleased with. To put this in context this student is ten years old. Left: The component pieces - shown in profile - a name label of the student that it was a gift for (bottom left). The four wheels and the 'reverse' scoop (at the rear of the tractor). The combined print time for these additional pieces of the project was four hours - this included the significant front scoop shown below. Left: The front scoop, the dominating feature of the design of the tractor. This was printed as part of the component pieces of the design, with the delibrate use of the grey PLA plastic to contrast with the base (see below). This is the print prior to removal of the 'rafting' we try and always keep this to a minimum as it essentially the waste of the print, but at times it is unavoidable. Level of Difficulty: High - it is slightly deceptive because while the print would appear straightforward it has been built from scratch and all of the component pieces need to work in relation to each other. There are significant additional features related to the presentation of this piece - some of these had to be redesigned several times to ensure that they were completed to the students satisfaction. It involved considerable design and reworking, testing and adapting - for this student the design stretched them to a considerable level and should be considered amongst the most difficult challenges for a ten year old student to complete. In addition to all these considerations the bottom line was that the deisgn needed to be functional, as it had a specific purpose and needed to work. Timeframe: Ten hours for the base, the foundation of the tractor and four hours for the additional parts to complete the design. There was potential to modify this to reduce the time - a combined fourteen hours for the entire design, as it usual for projects featured on this blog a 8mm nozzle was used on the printer and the infill was 20% of the total print (these are the default settings essentially). Size: The base of the print 100mm long, 50mm across, 60mm high at the front. It was 135mm high at the back. The inside storage part of the base was 35mm by 40mm and 70mm deep. The wheels were 20mm at the back and 10mm at the front. The main scoop extended 70mm across from the back to the front. The other additional features were relative to that. The student was fully extended by this task and completed it to the best of her abilities. Her intention with the deisgn was to experiment with using spray paint to complete the design, otherwise the print design, conception and production was considered extremely successful. Challenge: To produce a stand for a photograph. The frame has been laser cut to a students design. This is a display piece for our Schools Lamb and Pet Day, where we have a significanat number of parents and visitors to our school to see students display work. be required to hold up the photograph. Level of Difficultly: Low - this was a free sourced design that we needed to produce in large numbers in a relatively short timeframe. As a result of this the usual process of prototyping and problem solving was not completed. We ideally would have liked the opportunity to produce original work - but it was not feasible. Timeframe: Each of the inidividual stands have a forty minute timeframe to complete, obviously multiplied by the number of stands required. The stands themselves are hollow as can be seen in the photograph shown on the left. Size: The design has a width of 90mm. It was 35mm high. The thickness of the design was 5mm across. We could have look at modifiying the size of the stand to hold more weight. Some of the laser cut frames were particularly large and needed additional support. We had a very short time frame to complete the design and produce the stand. In normal process we would undertake a significant amount of testing and checking relative to the strength of the 3D Print to achieve the best result for the size of the print - in this case it was not possible. We also allowed the studenst to have some freedom with the width and height of the laser cut design, and while this was produced in MDF Wood, so it was relatively light, it also meant that producing a stand was challenging. This is intended as an explanation for the term of 'rafting' that is frequently discussed on this blog. 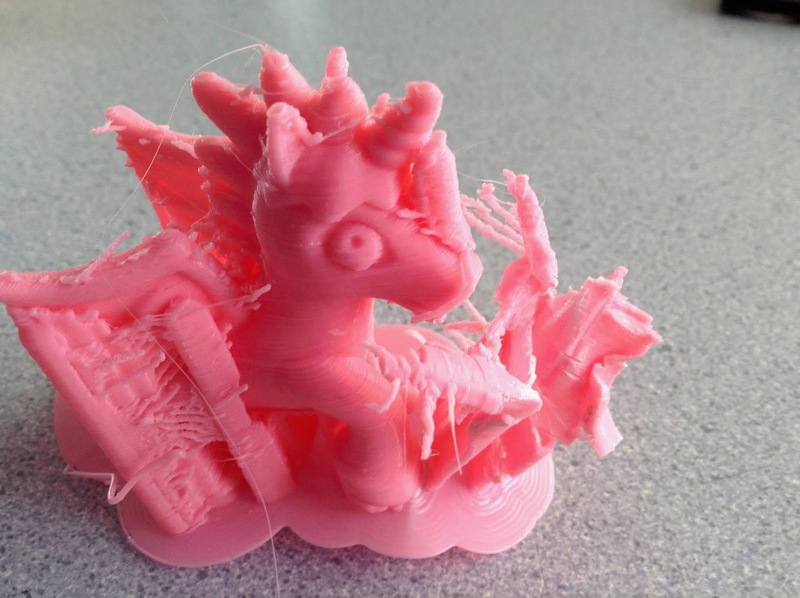 This is part of the 'beginners guide to 3D Printing' which is aimed at teachers and students who are printing for the first time or looking at different aspects of 3D Printing. On the left is a basic 'Unicorn' design. The design is freely available on Tinkercad, and is public domain. It is 70mm across, 60mm high and 30mm across. This is the design as shown straight after printing with all of the 'rafting' still present on the design. 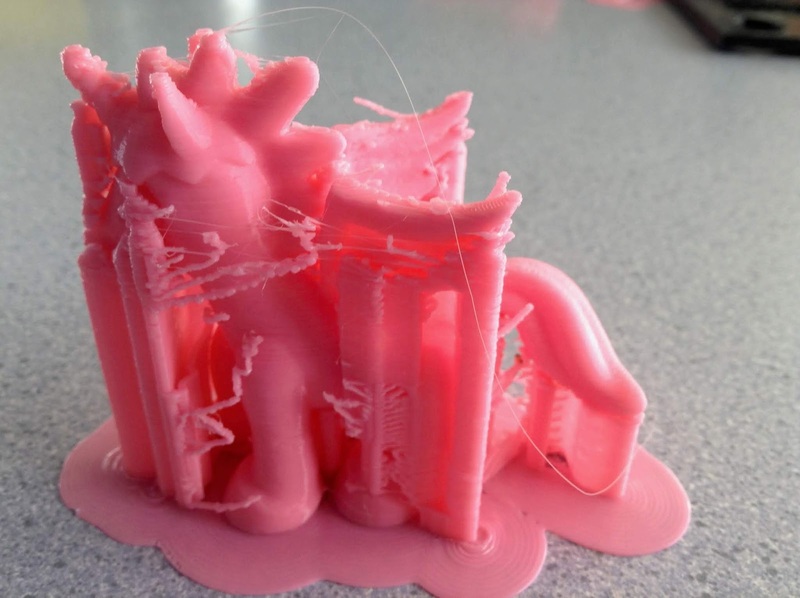 Generally the teacher in the classroom removes the rafting himself, as it at times can be somewhat difficult for students (particularly the younger students) to remove the rafting without damaging the print. This depends on the print itself and the details of the print, an object that has thin and detailed parts can sometimes require particular attention to remove the rafting. In the case where the rafting is broken it tends to be repaired with superglue when it is possible. The basic tools to remove this rafting that is used by the teacher is a basic pair of pliers with a cutting edge to them. The second key tool used is a small screwdriver with a 80mm length and a width of 3mm. This tool is key to removing small amounts of rafting in delicate locations which cannot be generally removed without causing marking or damaging onto the print itself. The breaking of the rafting around the head of the unicorn and the base of the unicorn. This has been completed by using the pliers to break the rafting and then wedge out the rafting using the screw driver. The removal of the rafting is nearly complete. Particular care has to be taken around the wings of the Unicorn as it the connection between the wing and the body of the Unicorn is only 2mm thick at the place where it joins. This typically would be an area where we would experience 'breaking' of the print. The tail can be seen with particular care needed to remove it without it breaking. The removal of the rafting is now complete. 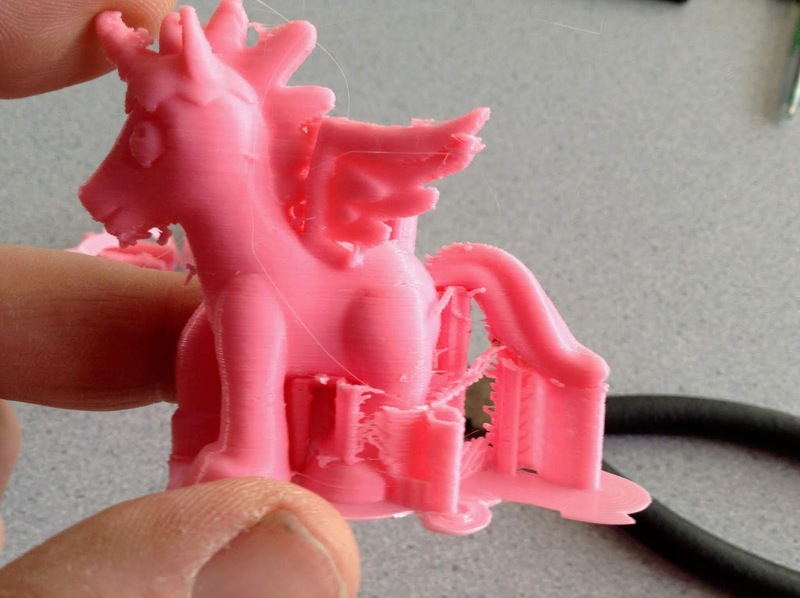 Despite all due possible care one of the wings of the Unicorn has detached from the print. At present there is considerable rafting waste from the print which needs to be disposed of. This is part due to the design, which the head has produced considerable rafting as part of the design, some of the more rectangular objects produced have little or no rafting. The wing will be attached with superglue prior to printing.